The apartment was really good, bigger than expected and in a great position for transport. Das Apartment war sehr hübsch eingerichtet. Die Lage war super. Die Küchenausstattung war sehr gut. 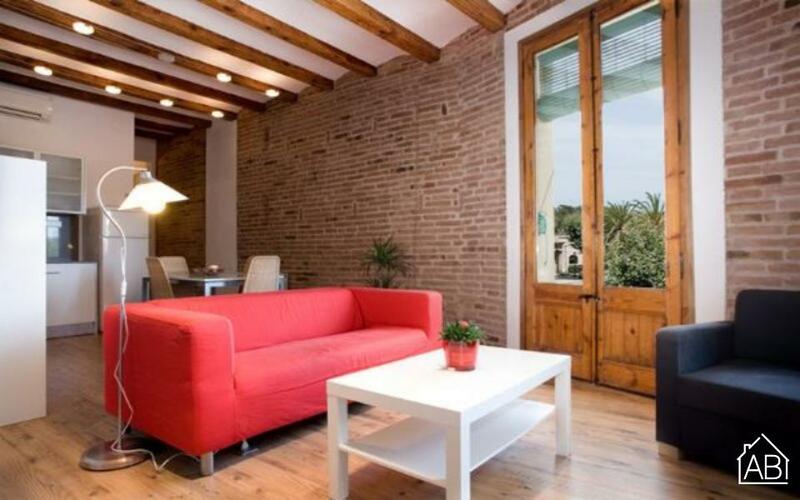 This spacious and modern, two-bedroom apartment is situated in the Poblenou area, on a large street and only a short walk from one of the most beautiful beaches in Barcelona. Accommodating up to four people, this sunny apartment has been recently refurbished and decorated to offer a very relaxing and peaceful stay in Barcelona. The apartment has an open feel and is filled with natural light as there are large windows and patio doors throughout. The living room has a comfortable sofa and two stylish armchairs, alongside a TV with satellite, perfect for relaxing after a day of sightseeing. The general décor of the living room is a mixture between the original design and the reformed/restored decoration you can see in the rest of the apartment. There is a dining table and chairs, where you can enjoy everything from an espresso to a home-cooked meal in the well equipped kitchen. The master bedroom has large double bed and is decorated in a simple style.You will also find plenty of storage space for your belongings and a great view from the large window. The second bedroom is full of natural light. It has large white wardrobes along with two single beds which could be made into a double bed on request. The bathroom is beautifully decorated with natural and earthy colors and a cool, modern glass sink counter.This apartment is very up-to-date, even down to the bathroom furnishings. This warm and welcoming apartment is the ideal home-away-from-home and will ensure a comfortable stay on your trip to the Catalan capital!